A lot of the time while visiting Dubai, you find yourself up in the rarefied atmosphere gazing down upon the city beneath. Cars and pedestrians below begin to look more and more like toys or models, more at home on a train set the higher you ascend, and Dubai offers the highest places someone who is not trained as a mountaineer can rise to. Love Boats UAE provide the perfect opportunity to reconnect and come back down to sea level. The magnificence of Dubai is often above you and the best way to appreciate this is far out to sea and witness the ever-changing sky line from afar, attempting to put things back into perspective from the midst of the beautifully blue Persian Gulf. 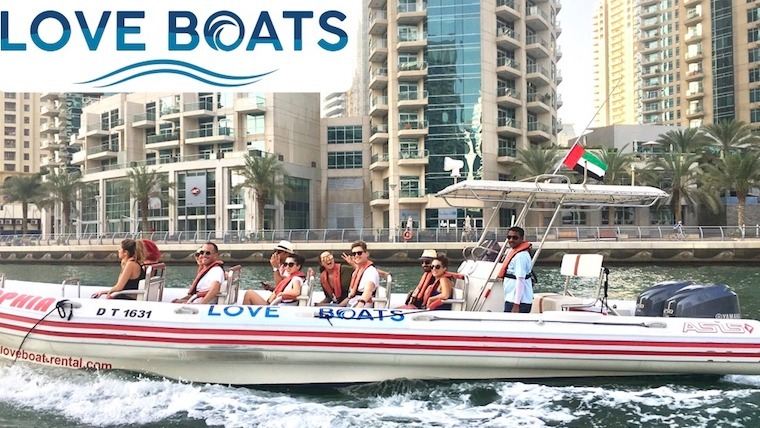 A trip with Love Boats presents the opportunity to gawp at the technological wonders and engineering feats of some of the world’s largest artificial archipelagos such as the Palm Jumeirah and the paradise retreats and residences that have been built upon them. Do not forget your sea legs as each tour will whisk you around the Palm at a considerable rate of knots, carving and bouncing through the wake you have left behind. Not so much a white knuckled ride but a wonderful experience of speed and exhilaration. We embarked on our speedy and adventurous voyage from the midst of the hubbub of the famous Dubai Marina on the ultimate Tour 90 minutes. Very soon we were skipping over waves of the beautifully briny sea. The breeze was revitalising, a brief but appreciated respite from the heat of the Arabian Desert. Travelling around and through the Palm, we marvelled at the mighty effort of land reclamation that has expanded Dubai’s coastline by a whopping 520 kilometres. We zoomed up to and past the giant sail like building, the world’s only seven-star hotel – the Burj Al Arab. It really is not difficult, and you can be totally excused for thinking of yourself to be a little like James Bond. 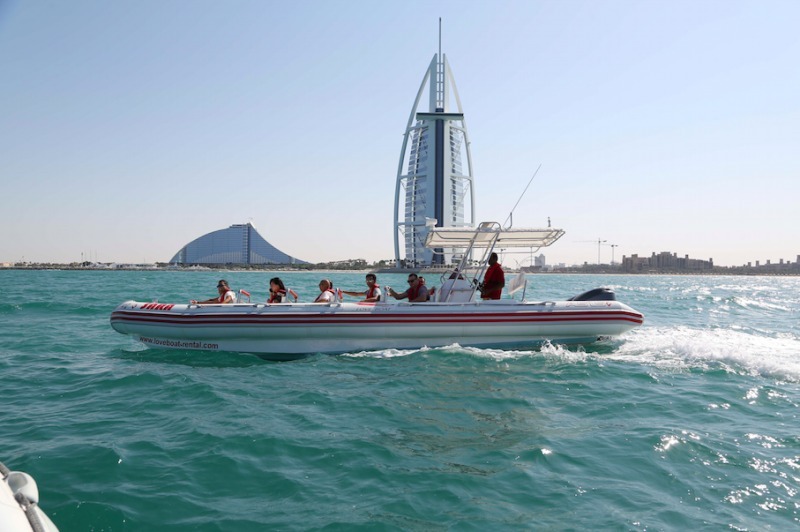 A voyage on Love Boats UAE is a great opportunity to truly appreciate the manmade marvel that is Dubai. The team are highly skilled and informative of the history of and present-day Dubai. Dubai provides many opportunities where you can feel like a giant being the lord of all you survey to feeling humbled and dwarfed with all that has sprouted over your head over the last decade. It is certainly a worthwhile adventure and was a perfect way to round up a marvellous and adventurous stay.